Who likes Food Trucks and Mummies? I do of course, and I am sure you will love them both on August 31 at the Museum of Science & Industry! 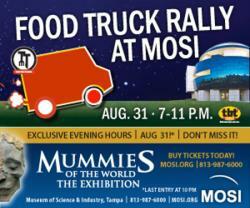 MOSI celebrates the Week of Welcome with the Tasting Tampa Food Truck Rally! Try food from the area&apos;s coolest food trucks, enjoy great games and music. The special engagement exhibition, Mummies of the World, closes soon, so don’t miss a special opportunity to experience it at night. Conquer MOSI’s Sky Trail Ropes Course and Zip Line, and check out The Dark Knight Rises on Florida’s largest and only IMAX DOME Theatre. MOSI’s standard exhibit galleries also will be open. MOSI.ORG • 813.987.6000. It&apos;s gonna be tons of food and fun so be sure you don&apos;t miss out on this one folks! For more updates on things to do in Tampa Bay and Tampa Dining, be sure to check us out at www.VisitTampaBay.com!